This is an entry that’s been a long time in coming. It may get a bit verbose, and I apologize. If you’re not interested in personal ramblings and art-related discussion, feel free to skip it. 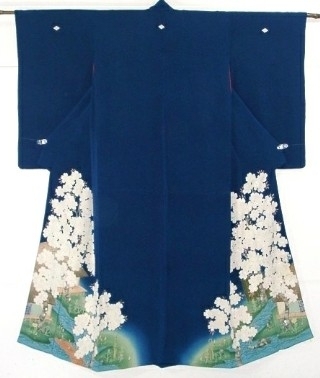 My interest in kimono stemmed from an interest in traditional Japanese aesthetic in general, which I believe I inherited from my grandmother. 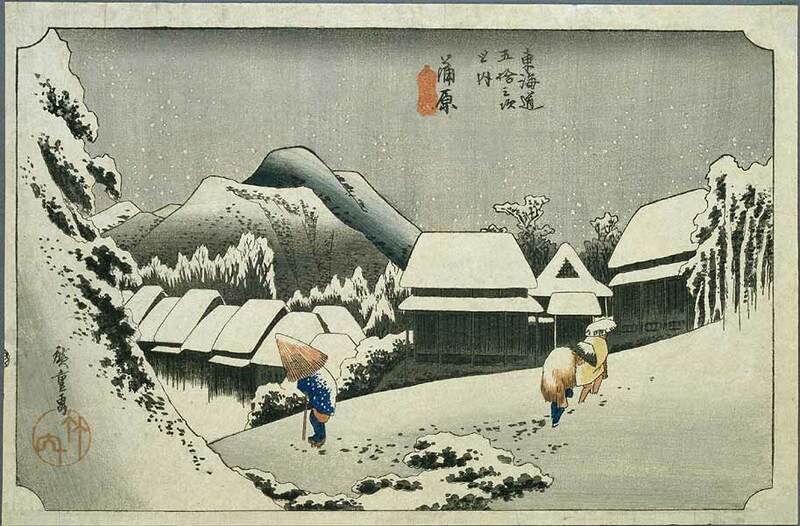 I have always been fond of traditional woodblock prints; landscapes in particular. The Tokaido Road is a highway connecting the New Capital, Edo (tokyo), with the Old Capital, Kyoto. There are 53 famous way-stations along this road, plus the start and end points. Edo-era artist Hiroshige Ando became so enamored of the views of these stations that he produced several series of prints, known as the “Stations of the Tokaido“. There are four editions of these, each from slightly different vantage points and during different times of year. The most famous, however, is the Hoeido Edition, and is the one I will most often be referencing here. About a year ago, I found an obi on Ichiroya of a snow-covered cabin in the mountains. As soon as I saw it, I felt an immense pull and a desperate desire to have it. As I’ve mentioned before, my best friend lives in Colorado, and I often go visit him (sometimes buying kimono while I’m there), and I initially chalked the nostalgia the obi made me feel to my love of the mountains there. 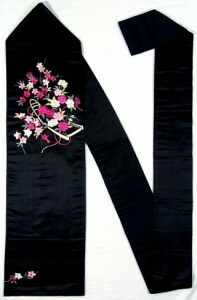 Naomi‘s darling husband Arian took pity on me and my obsessive infatuation, and bought me the obi as a gift. The more I thought about it though, the more visually and emotionally familiar it felt. It took me a while, and a great bit of help from Erica, it finally hit me. It was a creative interpretation of Station 15, Kambara, with the people removed. This discovery, unfortunately, created a torrent I’ve since been unable to stop. I dove headfirst into more detailed research of the Stations of the Tokaido, mostly on the internet, but in my own bookshelves as well. I’d actually purchased books about Hiroshige years before, and one that’s always come in handy is Hiroshige In Tokyo, by Julian Bicknell. Armed with a new wealth of information and a new obsesson, I dove in. I made the unfortunate discovery that these prints are a fairly popular motif for kimono and related items – obi in particular. With that knowledge in hand, I have begun to amass a “collection within a collection,” if you will. Since that first obi, I have acquired several more, and a decorative dance fan. My ambition is to eventually have items with all the stations on them, but that is a long-term goal for when I have much more expendable income! I am not sure, but I believe this is an interpretation of Station 14, Yoshiwara. As always, if you have further information or can read the text on it, by all means let me know. This one is also very special to me – I have mentioned before my love of hakata, so when I found an obi that was both hakata weave and several stations, I knew I had to have it. I saved up, and the day I was ready to purchase it, someone I know online bought it for herself. I’m not going to lie, I was devastated. 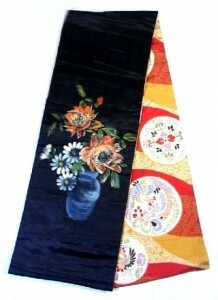 Through her own kindness, and the helpfulness of Yuka at Ichiroya, the obi found its way to me. I love it to bits. It contains stations Kuwana, Mariko, and Hakone. The last obi is another one of Hakone. I already had the hakata one at this point, but I loved the soft pastel colours on this one and it was a bargain, so I couldn’t pass it up. The last item I currently own is not an obi, but rather a nice, solid dance fan. It has the starting point (or station 0 if you will), Nihonbashi Bridge. I am, in fact, so obsessed with this that I am currently coveting a particular nail polish – NARS Tokaido Express. Those of you who know me well are aware that I also have a passion for doing my nails and ferreting away a huge collection of nail polishes (I have over 200 at this point). When I found this polish, I knew I had to have it! The fact that it’s a gorgeous rich espresso brown with purple and gold shimmer doesn’t help! 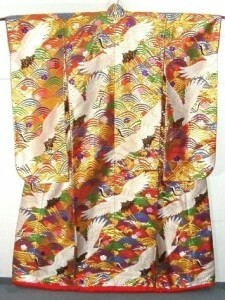 Unfortunately, it’s an expensive designer brand and actually more expensive than several of my cheaper kimono! I will have it eventually though! 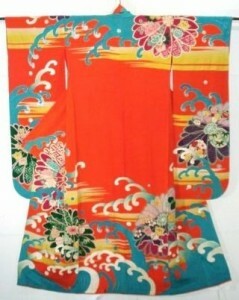 Probably much sooner than the kimono-related goal. If you would like to learn more about Hiroshige or purchase prints of his work, please check out the Utagawa Hiroshige page on Artsy. In the first entry of this series, I discussed the importance of buying what fits. 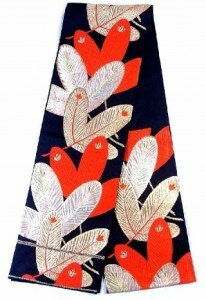 However, when it comes to buying vintage, one-of-a-kind textiles, this is obviously not always an option. Sometimes a piece comes along that’s just so stunning that you have to have it, even if it’s not the best fit. Thankfully, if you can’t make it, you can usually fake it. There are enough tools and tricks out there to help you achieve as smooth and clean a baseline as possible. This is a problem I suffer from greatly, as do many of my kimono-wearing friends. They’re just not designed for someone with melons like these! 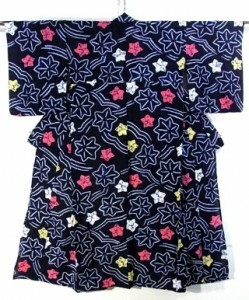 The first, and most ideal solution for this is, is a kimono bra. They are available on sites like Rakuten or JShoppers. However, these are again made with smaller Japanese frames in mind, and if you’re as heavily-endowed as I am, it may be a challenge finding one that will fit. 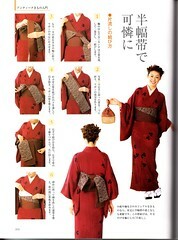 Another solution is sarashi, a cotton binding cloth that is wrapped around the torso. 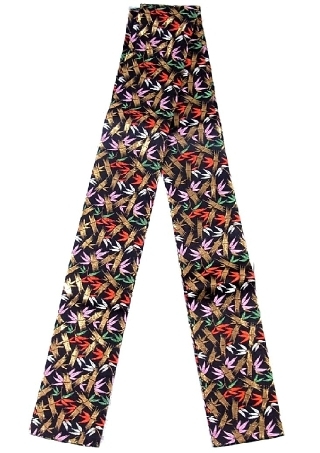 These give a great smooth line from bust to hip while remaining breathable. One suggestion I have heard of but not tried myself is a <url=”http://sites.google.com/site/binderreviews/resources”>Female-to-Male Transgender Binder Top. These are designed explicitly with the idea of flattening the bust as much as possible, for women making the transition to living as men. I imagine they would work well, as they are built for support and all-day comfort while supposedly remaining invisible. 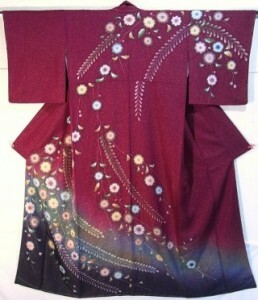 The only issue is that all the ones I have seen come up quite high in the back, which is counter-productive to having an elegantly low kimono collar. If anyone has tried this method, please let me know! I would love to hear from you! The quickest method, and the one I used to use most often, is the rubber datejime/elastic brace method. This requires a fairly common kitsuke accessory, the rubberized “easy datejime”. I place one of these over my juban with a sports bra underneath. It serves to flatten and hold down my bust. This solution works well enough, and here are a few outfits for comparison. The plaid ensemble on the left is using this easy method, whereas the flowered ensemble on the right is not – it’s ro, a sheer summer weave, and the fluorescent vivid green of my rubber datejime was way too visible! You can see how much smoother my bust is in the plaid outfit, compared to how it descends and curves over the front of the obi in the flowered one. The main issue with this method is that the datejime can slip over the course of a long day. I’ve since replaced it with an elasticized velcro abdominal/back support, easily available at any medical supply. I simply wear it above the bust, and it functions almost exactly like sarashi, with the added benefit of extra back support. Thankfully I don’t have quite as much of a problem with this, but it’s still an issue. The kimono was not designed with hips or a bottom in mind. Once again, your best bet is to find one with a decent hip wrap. If that’s just not feasible, there is an easy and inexpensive way to make sure your kimono doesn’t flap wide open in the front, exposing you in a dramatic and embarrassing way. Simply take a kohrin(kohlin) belt and clip it to the outer flap of your nagajuban, wrap it around your knees, and clip it to the inner okumi panel of the kimono. If you don’t have a kohlin belt, a single suspender from the closet or the thrift store works just as well. Just be sure it’s got plastic grips on the teeth – metal ones might pull or tear vintage silk! 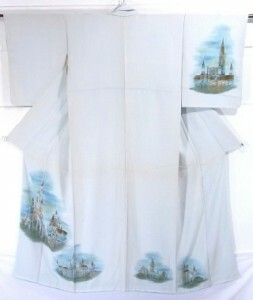 Vintage obi. They’re beautiful, but they’re also almost always too short and too floppy to work with conveniently. Thankfully this is a problem that plagues the Japanese too, as pretty much everyone was smaller around the waist back then. 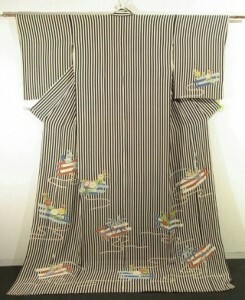 There’s also the matter of kimono going out of fashion due to the difficulty of putting one on, which led to the development of plenty of tools to help dress. One great such tool is the obidomekanagu, or obi clip. If you have an obi that’s too short to tie comfortably in a knot before tying your musubi, these are a tiny little pink godsend. 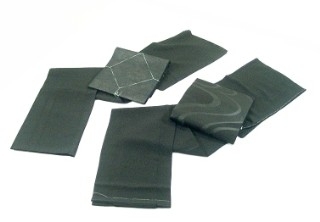 Rather than tie the two ends together, you simply clip them together with this tool, nestled snugly in the small of your back, and tuck your obi-makura into the curve at the top. It holds everything into place, and gives you ten to fifteen centimetres of leeway. 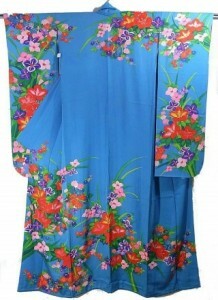 Hopefully at least one tip here will help you be a little more comfortable and confident in your kimono! Please let me know what you’d like to see in the next entry of this series, or if you have any tips of your own. The subtitle of this blog, as you may have noticed, is A giantess’ adventure in tiny vintage silks. What you may not be aware of though, is how giant I really am. The photos I post are typically alone, and don’t offer much to scale against. I’d like to take a few entries to discuss the challenges of size in the hobby of kimono, since one of the regular excuses I hear for awkward or sloppy kitsuke is “Oh, I’m too big” or “Oh, I’m too curvy.” This first entry will focus on the kimono themselves, and shopping smart. To start off, how big are we talking here? I am five feet ten inches tall. That’s 1.78 metres. I weigh roughly 175 pounds, or 79 kilos. My bust measurement is a cumbersome 46″ (117cm) around at the widest part. My bra size is currently averaging a 34F, though I recently bought a bra in a G-cup. Yes, you read that right. My waist is a reasonable 28″ (71cm) or so, and my hips are just passing the 40″ (104 cm) mark currently. My inseam when purchasing jeans is just over 35″ (89cm) high, from floor to groin. While this sounds like a figure most women would kill for (tall, long legs, big bust, small waist, rounded hips) it s by far the worst possible scenario for kimono. So how then, do I manage to pull off wearing garments from a country where the modern national height average for women is 5’2″, or 1.58m, and a bra cup size of B is considered “large”? The first, and easiest answer is to “buy big”. 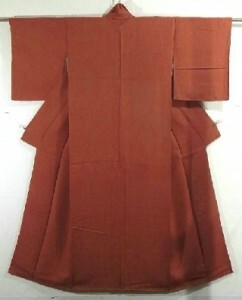 Modern everyday kimono are being made larger, to accommodate the fact that even women in Japan are significantly taller and wider than they were 50 or 100 years ago. However, this is not always an option, especially if you’re looking at older, one of a kind pieces. My best advice for this would be “don’t compromise.” That Taisho-era piece at a great price is still not a worthwhile investment if it’s so narrow at the hips that you can’t walk in it. If you truly have your heart set on vintage pieces, try looking for hikizuri – kimono meant to be worn trailing by either brides, geisha, or stage performers. 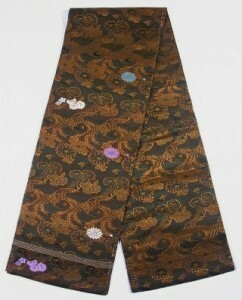 Older ones are generally about the right length to be worn “normal style” by taller, modern women. In this outfit, I am wearing a vintage bridal hikizuri, which should have been worn without a fold at the waist and left trailing behind me. However, it’s just the perfect length for me to fold and wear normally. When buying a kimono, the length should be the same as your height, the wingspan should be from wristbone to wristbone, and the hip wrap should be your own hip measurement multiplied by nearly 1.5 to get a full hip-to-hip overlap. 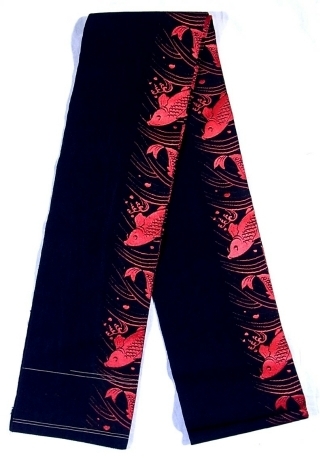 Since I know there is no way I will ever accomplish this, I aim for kimono a minimum of 60″ or 150cm long, a wingspan of 50″ or 127cm, and a hip wrap of 45″ or 114cm. There is no sure set of measurements that are acceptably “too small”, it’s always going to relate to how comfortable and familiar you are with kimono to begin with, but for me, those dimensions are workable. 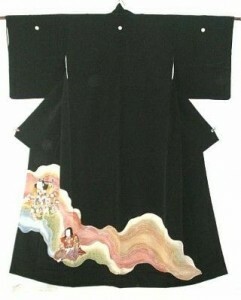 With tall height comes the all-important question – is ohashori truly necessary, if you find a kimono that’s wide enough but possibly too short? Nowadays, especially when it comes to wearing vintage pieces, the general consensus is that it’s not entirely necessary, especially for casual, everyday wear. So long as the rest of your kitsuke is entirely impeccable, and you’re ready and willing to back up and explain that it was a conscious descision, very few people (aside from perhaps notoriously fussy author of the Book of Kimono, Norio Yamanaka) are going to fault you. 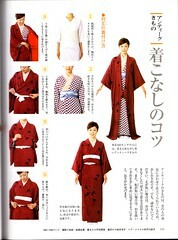 Naomi has taken the time to scan some wonderful instructions on how to put on a kimono that is too short for full ohashori. Please click the small images for a link to her Flickr, where the full-sized ones are contained. So there you have it – even Japanese kitsuke books are giving explicit instructions on how to dress, proving it’s not vital. Personally, I would not feel comfortable in a formal kimono (anything above an iromuji & fukuro obi combo) with no ohashori, but for everyday wear or going out to a casual dinner, it’s perfectly fine! 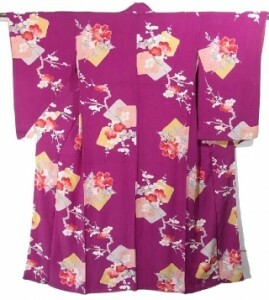 A well-fitting kimono is ideal, but that’s no reason to leave things in the back of your closet or tansu. Work with what you’ve got! As soon as I get a few things in the mail I am going to be posting an outfit I’ve got planned out with a too-short kimono. Since this is the first entry in a series, feel free to leave suggestions on how you accommodate a larger figure, or mention other things you’d like to see me discuss. The next entry I’ve got percolating is going to talk about foundation garments and padding, and why they’re so important.